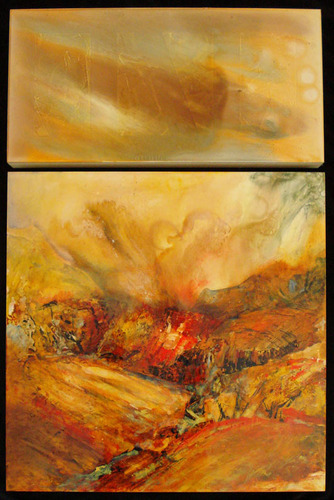 Today, we interview Sue Smith, whom I have come to know through her Ancient Artist blog. She also runs a studio blog and several other sites (including this one) related to her artwork and art in general. 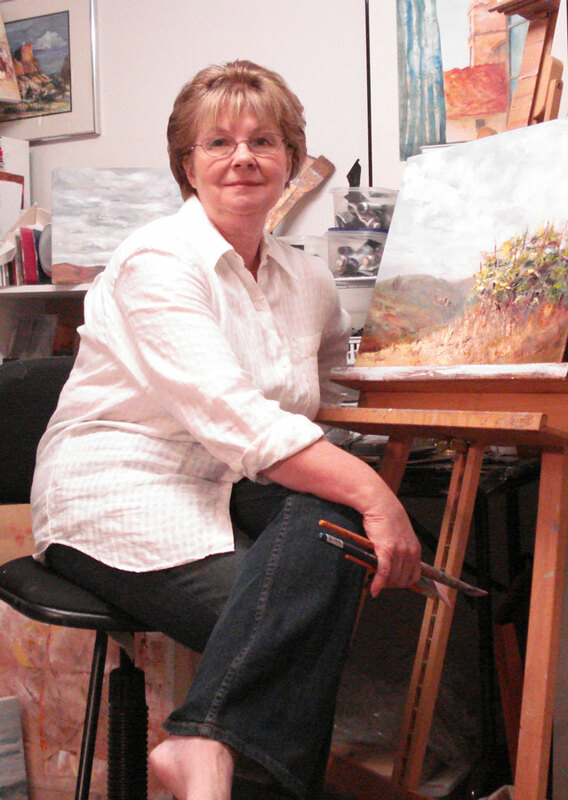 A contemporary landscape painter who also does work in abstracts and other areas, Sue always has something interesting to say about the creative process, and her insights as someone who became serious about her art later in life (she returned to school at age 51 to study art and graduated from Oregon State University—Cascades after receiving the Distinguished Student – Department of Art Award) provide valuable perspective in a youth-obsessed culture. Tell us about your creative pursuits, paid and unpaid. Smith: I consider myself a painter. When I turned 50 I took the risk to really educate myself and went back to school. But it wasn’t until I went to Italy for a painting workshop that I realized this was something I had to do. One minute, I was the old me, and in the next instant, I had passed through a doorway and wasn’t looking back. I write an “encouragement” blog called Ancient Artist because I remember how it was and is to feel isolated in this creative work we do. I work part-time in an art gallery because I have bills to pay, and because I enjoy moving artwork out into the world where it belongs. And I still have a turquoise ceramic pig that I made in art class when I was eight years old. It’s the only relic from my childhood and perhaps an artistic talisman, keeping close until I realized my purpose. Do you have any formal training in your creative discipline(s)? Do you feel training is important in creative development? Why/why not? Smith: I have a degree in art. Just a four-year degree, nothing fancy. And I traveled to Italy, where I stood in front of an original Titian and finally realized what painting was all about. It’s my opinion that the true purpose of education is, first, to begin to ignite your passion, and secondly, to teach you how to teach yourself. When I graduated, I had the mistaken impression that I was equipped to compete in the art world. I quickly, and sometimes painfully, learned that wasn’t the case. Good education points you in the right direction. It awakens your mind to the possibilities. But you have to take it from there. This is as much a craft as it is artistic vision. In order to bring the two together the artist must take that journey alone. Only through your own efforts in your studio, experimenting, failing, trying again, will your ability to paint what your mind envisions come into reality. There are no short cuts—just plain hard work and determination. Not very glamorous. What habits do you cultivate to facilitate your creative “flow”? Smith: When I am working in the abstract series, there is a lot of prep work. I find this to be very meditative, and it seems to connect me to the way artists worked in the Renaissance. When I’m in the “landscape” mode, or “figures,” it really takes the right image to get my inspiration going. This might mean going out on location, or searching endlessly through reference photos until one clicks. When I’m actually working, though, I listen to music to occupy my inner critic. Right now, she likes smooth jazz, but sometimes she prefers Italian opera. I’ve found it less stressful to give her what she wants. What advice would you give to a “blocked” artist in your discipline to free up their creative energies? Smith: When I’m blocked it’s usually due to one of two causes: either I’ve just come off an intense period of creation, and don’t realize I need a break, or I’m ready to move forward but I’m afraid to take the risk in case I fail. I think artists need to “not create” in order to refresh their minds and spirits. The more difficult challenge is risking growth. Where do I start, what if I fail, what if I’m just a one painting artist…my strategies are first to explore artistic work that interests me, read, journal, try to identify what it is I want to do, and then move forward. The technique of asking yourself questions and immediately answering them in a written format is very useful for working through hidden fears. And yes, I realize that rationally I won’t end up sleeping under a bridge if I try a new approach, but it sure can be hard to really believe it. It usually comes down to a leap of faith. And the knowledge that you can destroy the failures before anybody sees them. Which artistic project that you are working on excites you the most right now? Smith: Actually I’m in one of those “blocked” periods, so I’m cleaning up my studio. When I’m in the groove, though, I’m excited by whatever it is I’m working on. I will be totally passionate about what develops, in the studio, sometimes working 8 to 10 hours at a stretch, only coming out for coffee and chocolate. I love those periods. I live for them. How do you select your creative projects? What elements of a potential project tend to intrigue you the most? I recently realized that I use the traditional landscape mode as a sort of “incubator” for ideas that will eventually appear in the abstract work. 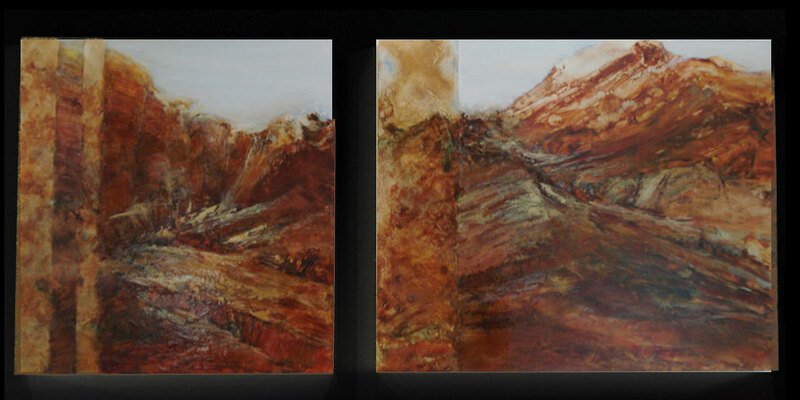 My landscapes are passable and are hanging in a gallery right now. But my abstracts probably excite me the most. I’m beginning to understanding how the two styles work together for me and are a necessary part of my process. So I guess you could say that I totally frustrate myself trying to paint realistic landscapes and then release those frustrations producing landscapes in an abstracted form that are truly unique, to the point that I stand back after a long session and wonder where that imagery came from…perhaps not “from” me but “through” me. Any other advice to artists to help them create more effortlessly? Smith: Well, that’s the rub, isn’t it? Creating art is hard, messy, sweaty, exhilarating, magical work. There must be authentic effort. That comes from painting—or whatever your medium—every day, every week, every year. There is no way around doing the work, so in that sense there is no way to create “effortlessly”. But from an emotional and psychological standpoint, there are strategies that can help you avoid common traps. Set up a routine that works for you and stick with it. Don’t beat yourself up if you mess up now and then, just get back into the pattern. It will get easier over time. Check in with yourself frequently. Be sure that your passion is still there and invite it out to dance. Believe in yourself. Believe in yourself. Believe in yourself. Set up a Blue File. This is where I recorded all the positive things people would say to me about my work. I would read this file whenever I was feeling blue and insecure. Eventually, my self esteem and confidence grew strong enough that I no longer needed the reminders. Check your preconceived expectations at the studio door. Go inside and do your artistic work no matter what that might be. Remember that while every human can be creative, only you can be creative in your wonderfully unique way. If you’re too afraid of rejection to ever express your inner voice, the world is that much worse off for it. Don’t let the world down. Thank you! I feel very honored. Your questions were insightful and made me think — actually clarify — some of the realizations that came out in this interview. You coached me in this way and I appreciated it. I’m sure your clients find your advice invaluable. Again, thank you for the interview. Sue’s a very special person and it comes through in this interview. Thank you both! Fantastic interview! Sue, you speak/write very well and express clearly your experiences. Thank-you Creative Liberty for the questions that allowed Sue to inspire us all!